Portable lightweight massage tables can be tricky little fellows to get right! You see these 11kg tables on amazon for sub £100 and think how can they do that? 20% goes to the government for VAT. They have to pay the factory and import costs and you wonder are these table being made for like £30? The price tag comes with some added shake rattle and roll!! Have a look on ebay to see how many of these same tables are for sale second hand. A LOT!! That is because the therapists starting out who buy them end up buying another massage table not so long after the first one. The ones that are lightweight quite often sacrifice size in order to reduce the weight. You will often see tables that are around 60cms wide or 180cms long. That is far too small to treat normal sized people and god help you if a large client ever books in with you. Let’s just say they won’t be coming back for seconds! That means the cheaper price massage table you tried to save money on is actually costing you money in loss of repeat business. 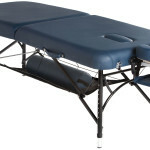 I like the BodyPro range of massage tables. There are only 4 models in the range. They keep the range small and do it right. Kind of like the menu of a good restaurant! They serve a massage table for every need and part of the market. There most recent launch is the BodyPro Active. I guess to sum up it addresses all my pet hate about lowered priced massage tables. 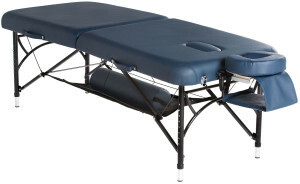 The BodyPro Deluxe wooden table is a hugely popular higher end entry level massage table. The BodyPro Deluxe ACTIVE uses the same comfort features but it is a lightweight full-sized aluminium table that feels like a tank. It feels very robust. Almost like it has broad shoulders and stand out among other lightweight tables. It is 13kg’s, so not a super lightweight table which are normally around 11kg’s but the extra 2kg’s are worth the piece of mind. The BodyProDeluxe ACTIVE is priced under £200 depending on where you shop. It is a great massage table not only for a student or beginner who needs a lightweight portable massage table but I would also recommend the BodyPro range to more experienced therapists who mostly do treatments from one location and require a second lightweight bed for mobile treatments. In terms of looks and styling, the black aluminium legs are very nice and the smooth curves of the easy access end panels are pleasing to the eye. The corners of the table are rounded and have reinforced stitching. The face cradle comes with aluminium rods unlike most tables at this price which normally have plastic rods which end up braking when too much force is applied. The face cushion is plush on this model and is contoured and ergonomically shaped like the fully professional ones are. As I only used this table for some mobile treatments, it took me longer to test enough to be comfortable enough to recommend. I have had it for 3 months since May and taken it on around 2 treatments per week as I mostly use my Porta-lite Delta II for mobile calls. I’ve used this one over 30 times and it is time to give it the thumbs up and recommend it to you. If you want a light table that feels very very solid, this is for you! Have any questions – leave your comments below! So bummed this is out of stock now. Was going to get it as a Christmas present to myself. A few of my fellow students on my course have it and love it. Website says it will be back in stock 23rd January so have place a pre-order for it. Excited to get it! Thanks for the reviews Stephen, hope you have a lovely Christmas and some valuable time off.